George Strait ’s thirtieth studio album, Honky Tonk Time Machine , is set to arrive March 29. 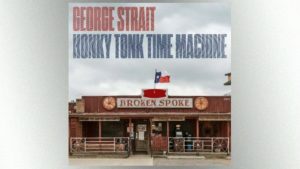 In keeping with the title, King George doesn’t appear on the cover: instead, it’s a picture of the Broken Spoke honky tonk in Austin, Texas. 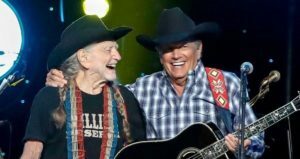 The Country Music Hall of Famer co-wrote most of the album with longtime collaborator Dean Dillon and his son, Bubba Strait . The family affair continues on the new track “God and Country Music,” which includes a guest vocal from his grandson, Harvey Strait . The album closes with a cut George co-wrote and sings with the Red-Headed Stranger. This weekend, George notches his twenty-first and twenty-second sold-out concerts in Las Vegas. He’s also adding a second show in Ft. Worth Texas on Saturday, November 23, due to high demand. Tickets go on sale next Friday. This entry was posted on Saturday, February 2nd, 2019 at 10:39 pm and is filed under Albums, Duets and collaborations. You can follow any responses to this entry through the RSS 2.0 feed. You can leave a response, or trackback from your own site.